While we do our best to assist buyers and sellers throughout the community, Kentucky Select agents excel in a few particular Louisville neighborhoods and market segments. Since our agents know and work these areas so effectively, we thought we’d share some insights into market dynamics in these 5 zip codes as well as the Louisville luxury market. As a reminder, a market's absorption rate measures the rate at which available homes are sold during a given time period. Generally, an absorption rate of 6.0 months inventory indicates a balanced market of supply and demand. As you can see from the tables below much of Louisville is experiencing a severe shortage of inventory (absorption rates of around 2 to 2.5). Because of the lack of inventory much of Louisville is in the midst of a very heated seller's market. 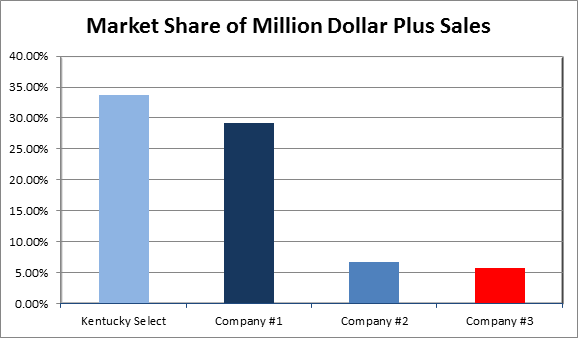 In the luxury category Kentucky Select ended the first half of the year with a market leading 11 sales or a 33% share of homes or condos that sold for $1 million or more. This compares to 8 million-dollar-plus sales for the same time period in 2015.